#NRLFinals Notes 17/9: NYC split is counter-productive, Player of the Finals Votes, Refs gooone, PNG squad named, Lucky Linnett, Cowboys fine..less, 1998 Brisbane-Melbourne Finals Highlights. Every day during the work week (so Monday to Friday in September) www.wdnicolson.com will have NRL Finals Notes for you to digest at the start or end of the day. If you need to know something heading into the weekend Finals - you'll read about it here. [Q] DAILY QUESTION: Which Melbourne star has the most NRL Finals games (including years stripped of their premierships): Cameron Smith, Billy Slater or Cooper Cronk? 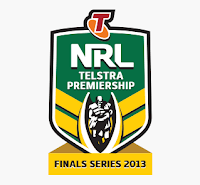 Winner of Manly/Cronulla plays the South Sydney Rabbitohs at ANZ Stadium, Winner of Melbourne/Newcastle plays the Sydney Roosters at Allianz Stadium. The actual days of each Preliminary Final at TBC but it is likely the NRL puts the Souths' game on Saturday night to maximise the crowd, and the Roosters' game on Friday given the proximity to the city. But it also means the Storm/Knights winner gets a short week... so there's that to consider right? Because they won't be playing the NYC Elimination Final there this weekend, instead they'll play at 3pm on Friday in Sydney and they'll draw exactly how many extra fans because of it? For the Raiders travelling to Melbourne or Sydney won't make that much of a difference by air and yes the Tigers would get a benefit from not having to travel... yet the Raiders finished 1st and the Tigers 6th... so where exactly does giving the lower seeded team make much sense? But that's the least of the concerns here... why deny the Melbourne sporting public a chance to see the 'showcase' of young Rugby League talent when there isn't an AFL game to go up against on Saturday? And make them pay more for the chance not to do so... It boggles the mind. The referees who can't count are goooooone... Henry Perenara and Matt Cecchin have been put out to pasture for the rest of the 2013 Finals - which begs the question - how do Video Referees not get sterner treatment for stuffing up with hindsight? If an on the run play gets an investigation... how do Video Referee calls get next to no scrutiny and if they do - the coach gets a $10,000 fine for saying what everyone else could see? Cronk won in 2012 - can he repeat? All the Votes are in for the 2nd Annual @NRLTweet Player of the Finals Award. The Voting Team are formed into in 3 person groups to break down each semi final and hand down 4-2-1 votes. M Duncan: 4 J Lima, 2 S Burgess, 1 W Chambers. M Trodden: 4 S Burgess, 2 J Lima, 1 B Slater. B Hoese: 4 G Inglis, 2 B Te'o, 1 B Goodwin. W Nicolson: 4 M Gordon, 2 J Tamou, 1 J Taumalolo. M Spillane: 4 M Gordon, 2 J Thurston, 1 J Tamou. J Davies: 4 M Gordon, 2 J Thurston, 1 A Winterstein. M Spillane: 4 P Hiku, 2 J Maloney, 1 J Friend. N Wilbow: 4 L O'Donnell, 2 J Maloney, 1 J Lyon. W Nicolson: 4 J Maloney, 2 J Friend, 1 P Hiku. A McMurray: 4 J Smith, 2 B Scott, 1 A Uate. M Vickers: 4 B Scott, 2 A Uate, 1 J Smith. G Delaney: 4 D Gagai, 2 B Scott, 1 J Mullen. 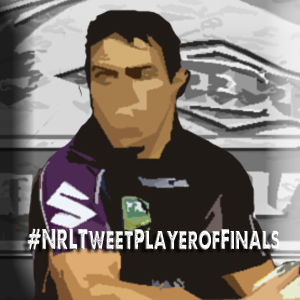 Every game through the Finals you can follow the votes via #NRLTweetPlayerofFinals and they will be Re-Tweeted via @NRLTweet right after each game. NOT The Footy Show wraps up Finals Week 1 with a 12 minute Podcast recorded live at ANZ Stadium before and after the Knights-Dogs on Sunday. It appears Ben Pomeroy is a rather lucky guy... John Dean posted a Vine Video of the Cronulla centre lashing out at the jatz crackers of Kane Linnett with his forearm aimed between the centre's legs... yet Pomeroy attracted no attention from the NRL Judiciary for what at the very least is contrary conduct if not a striking charge. But we all know the reason Pomeroy didn't get charged (outside of the Match Reporting process completely missing something again)... Linnett didn't go down like a sack of spuds and claim he'd ruptured a testicle... thus proving that damage was indeed done by Pomeroy and thus his actions should have resulted in weeks out... because if the victim gets hurt, it makes the action more serious right? And as we write - the NRL has yet to serve the Cowboys with any fine for their post-match comments about an anti-Queensland conspiracy in the NRL because NSW can't beat QLD. The Prime Minister's XIII for the unofficial test with Papua New Guinea has been named with all but the final six teams putting up players for selection. Jarryd Hayne remains well in Australian coach Tim Sheens' plans after being picked at fullback, while Aiden Tolman finally gets some love from representative selectors despite being named as 18th man - WAIT no he doesn't, Tolman withdraws, replaced by Ben Hannant as 18th man. J Hayne, B Morris, B Tate, J Morris, K Gordon, G Bird, A Sezer, R James, R Farah, J Tamou, S Thaiday, J Papalii, C Parker. Bench: G Cooper, M Gillett, D Shillington, J Reynolds, B Hannant. The most curious selection is Greg Bird at five-eighth... he's a backrower and a very good one at that, but what is this obsession with playing him in the halves and deny the chance to unearth another playmaker at rep level? 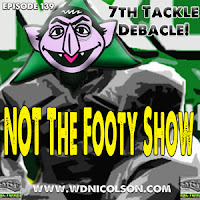 All the Finals Week 2 Teams with Injury and Selection Analysis on www.wdnicolson.com will be available Tuesday afternoon. The big concerns this week will be Todd Carney (hamstring) and Andrew Fifita (knee) for the Sharks, Brett Stewart (hamstring) for Manly and Sisa Waqa (neck) for the Melbourne. Brisbane v Melbourne... 1998 Finals Week 3. The Storm's debut season may have finished in a Top 4 spot but they lost both their semi finals to bow out in straight sets... and got smashed by the Broncos in the 3rd week of the rather complex finals series of 1998. Most interesting part of this game outside of Brisbane's performance was the semi between a Melbourne team and a Brisbane team was played at the SFS and drew over 20,000 people... will Manly v Cronulla do the same as two Sydney teams this Friday? [A] DAILY QUESTION ANSWER... Slater has played in 24 Finals, Smith in 23 and Cronk in 22. 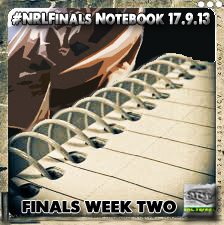 We want your feedback or suggestions for the #NRLFinals Notebook - drop us a line here, @NRLTweet or Comment below.